Unfortunately telecom lobbyists are working overtime to convince committee lawmakers to add dangerous amendments that could completely gut the bill and leave gaping loopholes for Internet providers to block, throttle, and charge users new fees for access. 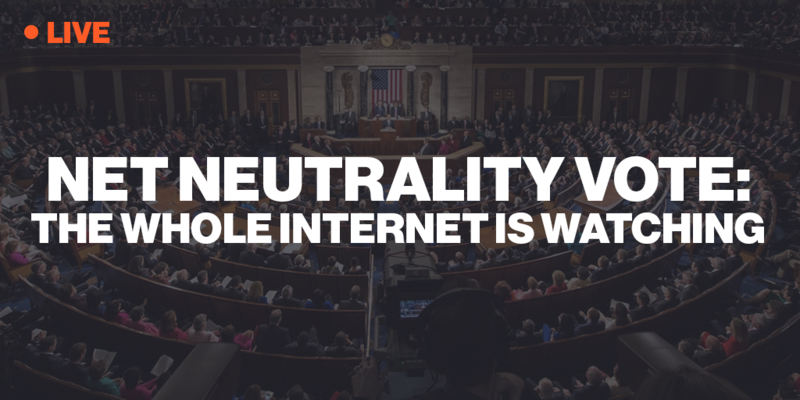 To pass a clean bill with no bad amendments we need everyone to call their members of Congress and make sure they know the whole Internet is watching. If we get the bill out of committee without any bad amendments, then we have a solid shot of winning the next big vote on the House floor in the week of April 8. But if the bill gets gutted, we’re back to square one. Call your lawmakers ASAP and demand they vote for a clean bill to restore net neutrality. We're just a few Congressional signatures short of triggering the Congressional Review Act on Net Neutrality (we've already got the Senate); and that will push Trump to have to publicly reject Net Neutrality (which 87% of Americans, including a majority of Republicans, support) or override the FCC and restore Net Neutrality to America. California's resurrected #NetNeutrality bill just passed a hurdle. Californians, here's how to help. California’s Net Neutrality bill just passed out of committee and is on its way to be voted on by the Assembly. If you are a California voter, please take a moment now to call your assemblymember and tell them to vote “yes” on SB 822.